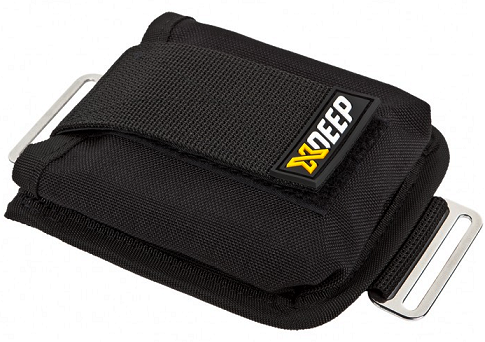 XDEEP trim pockets can be mounted both to the shoulder straps and to the waist strap. To make them more comfortable, we put inside the pocket a special reinforcement plate made of highly durable polymer. It makes the weight fit tightly to the strap. Therefore, nothing is loose and nothing bumps. The XDEEP trim pockets can be used with any sidemount or harness made of 50 mm (2 inch) webbing. · Can been attached to any standard webbing, with one tri-glide at each end of the weight pocket to ensure that the pocket doesn't move from its set potion so that precise trim can be achieved. · Made from heavy duty condura to provide amazing abrasion resistance. · Available in two sizes, the Medium pocket can take up to 3kg per pair, whilst the Larger pockets can take up to 6kg per pair.